When I was researching for my post on Mother’s Day crafts (which will melt your heart, by the way), I was overwhelmed with how many amazing things I found, and I had a really hard time deciding which ones were my favorite. So when I sat down to compile a list of Father’s Day crafts to share with you, I expected the experience would be the same. There aren’t a lot of Father’s Day crafts out there. But I’m nothing if I’m not persistent, and I managed to find 10 fabulous Father’s Day crafts you will absolutely love. 1. Make this adorable Letter Blocks for Dad keepsake by Stories by Me. 2. Give dad the gift of style with one of these handcrafted paper neck ties by Artsy Ants. 3. But out the brown construction paper and white yarn and make dad one of these cute, laced footballs by Mom on Time Out. You can easily personalize these with an “I Love You Dad!” or “World’s Best Dad!” using a little glue and glitter! 4. Do a mini-photo shoot with your kid(s) and make this DAD Photo by Twinkle Toes de Lux. I bet it would look great in his office! 5. Make one of these fun, personalized bookmarks by Come Together Kids. 6. Get out all of those rocks your kids keep collecting and make this adorable My Dad Rocks Frame by Mommy Moment. 7. Stroke his ego with this Dad Rocks Paperweight by Our Family World. 8. Make one of these Dad Collages by Crazy About My Baybah. 9. Make him one of these adorable Coffee Cozies by that artist woman. 10. Melt his heart with one of these Popsicle Stick Fix-It Signs by Pink and Green Mama. 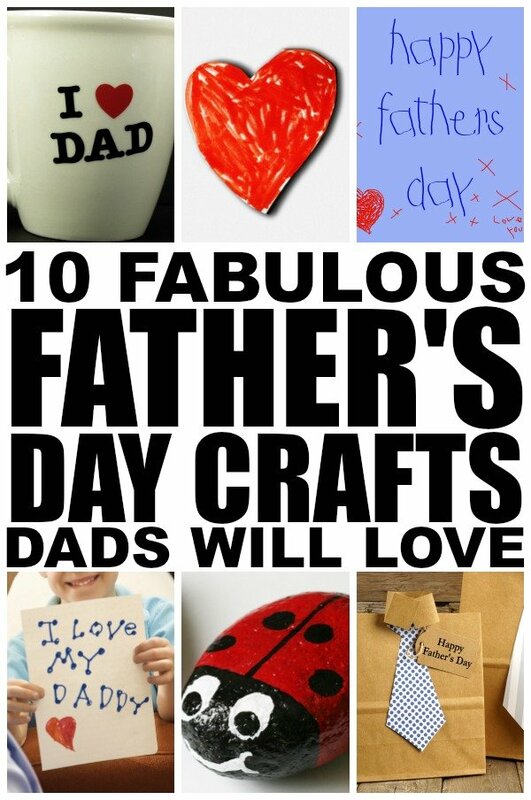 If you liked these Father’s Day Crafts, please share them on Pinterest!